Part of the genius of the Nike slogan Just Do It is that it speaks to a fundamental – and empowering – truth about human nature. It feels good to Just Do It. Do what? Anything. To get up and moving. Once you get started, physically and mentally, you often find it’s easier than you expected, and progress comes quicker than you thought. When you think about it, there are only two options to Just Do It. Number one, you can decide to do it Just Do It Later. You will do it when the timing is better, or when you have more money, or when you feel more like doing it. And sometimes it is indeed the right thing to sleep on a big decision, or wait to act until you have more information, or when the timing is better. But often this is merely procrastination masked as prudence. Procrastination saps energy, stalls momentum and creates stress. Plus it doesn’t get you any closer to Just Doing It. But even worse than Just Do it Later is Just Do Nothing. When you Just Do Nothing, you’re stuck. You’re a bystander, an onlooker, not a participant. 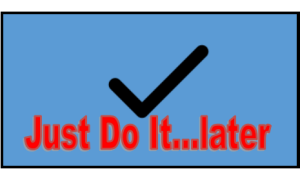 I witnessed many cases of Just Do It Later and Just Do Nothing when I was an insurance risk manager and in private practice representing lawyers before the State Bar. I saw the sad consequences: missed deadlines, last-second errors, shoddy work product, malpractice claims, law license in jeopardy. So pledge to follow the advice of Nike and Teddy Roosevelt. Just Do It as if your livelihood depends on it, because it well might.